A simple but useful experimental method for observation of the effects of organic modifiers in the stationary phase in reversed-phase liquid chromatography (RPLC) is reported. An octadecylsilica (ODS)-packed column, used before and after treatment with low molecular weight alcohols (methanol, ethanol, 1-propanol, and 1-butanol), was employed for analysis of two groups of water-soluble model analytes by RPLC with water as the mobile phase. The first group was a mixture of 14 species of nucleosides and their bases and was used to represent hydrogen-bonding analytes, whilst the second group was a mixture of seven alkylsulfonates used to represent hydrophobic analytes. For both groups of analytes, alcohol-modified ODS stationary phases gave higher resolution and a shorter retention time than untreated ODS. 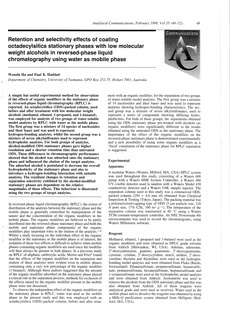 These differences in chromatographic performance showed that the alcohol was adsorbed onto the stationary phase and influenced the elution of the target analytes. The adsorbed alcohol is postulated to decrease the overall hydrophobicity of the stationary phase and also to introduce a hydrogen-bonding interaction with suitable analytes. The resultant changes in retention and separation selectivity exhibited by the alcohol-modified stationary phases are dependent on the relative magnitudes of these effects. This behaviour is illustrated using the two groups of target analytes.